The Desert State; The Golden City: rising up out of the Thar’s arid sands like a mirage in the distance. There is something magical about Jaisalmer. A former stop-off along a well-traversed trade route west it has witnessed a cast of colourful characters, worthy of the ‘1001 Nights’ tales. 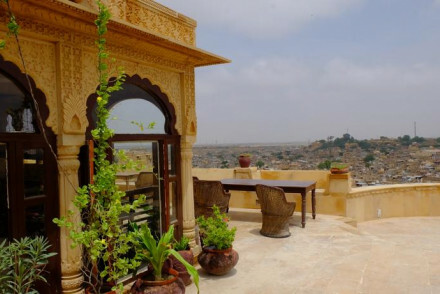 Our pick of the best places to stay in Jaisalmer all reflect the living history and exoticism of this unique city. To pass through its ancient ramparts is to enter a world of winding alleyways littered with people, animals, cycle rickshaws and street hawkers. Look skywards and you will see intricately carved spires and turrets pointing toward the firmaments. With its Labyrinthine Fort, consisting of ninety-nine bastions surrounding its still inhabited twisting lanes it is a conglomerate of temples, havelis, shops and dhabas. This is camel country. Camel trains can be seen toing and froing from the city; heading out for an overnight stay in the desert. Something of a tourist trap, but they do provide a truly immersive stay. Ask your hotel to recommend or book you a trip with a reputable camel safari company to avoid disappointment. Sleep by the fire under a blanket of stars. Synonymous with the town of Jaisalmer, is its fort. It is a living monument with 3000 inhabitants still residing within its walls. Founded in 1156 this ancient structure is today a World Heritage Site and a visit to Jaisalmer is impossible without exploring this masterpiece. 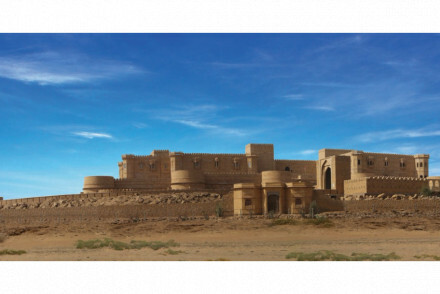 To truly appreciate Jaisalmer’s majesty and its sheer isolation walk around its walls. Surrounded by shimmering sands, relentlessly baked by the Rajasthan sun you cannot see another city for miles. It is a sight of biblical intrigue. A first amongst equals Patwa-ki-Haveli is our top pick amongst Jaisalmer’s seemingly endless offering of heritage haveli properties. Built by five Jain brothers who made their fortunes in in textiles and jewellery today it is part museum, part private dwelling. It goes without saying that Jaisalmer is a desert town. Therefore, like much of the rest of Rajasthan it is best visited during India’s winter months, between October and March. But bear in mind that it can get pretty chilly in the evenings (especially in the desert) so bring some layers for those evenings under the stars. 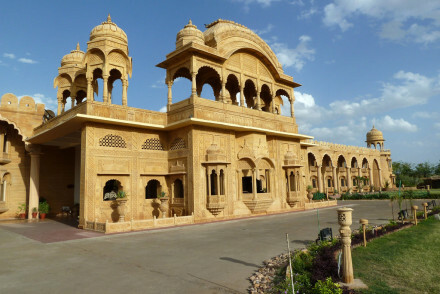 Our pick of the best places to stay in Jaisalmer all provide a unique stay true to the culture and heritage of the city. Boasting ornate Mughal architecture the 16th century Fort Rajwada is to step back in time. Dine al-fresco around the glistening pool. There is also a spa and some impressive painted wall murals. Further out of town Suryagarh, surrounded by the golden sands of the Thar desert is a truly princely stay. Complete with palatial rooms, billiards, as well as all the amenities you would expect from a 5 star Indian stay: pool, spa, yoga and excellent service. 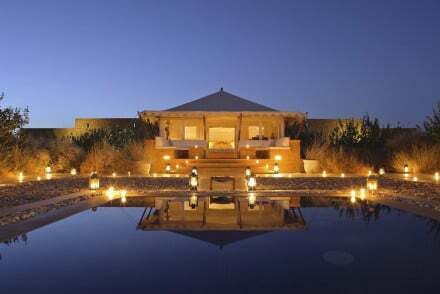 The jewel in Jaisalmer’s crown, The Serai is where one comes for some serious pampering (if you can afford the hefty price tag that is). Well worth the money, guests are treated to luxurious tented accommodation in the heart of the desert. Fine dining, plus a renowned spa and stunning pool. The ultimate desert experience. 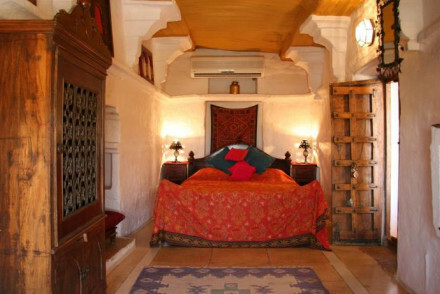 If your looking for some added privacy, visit our online partner Booking.com and browse their private apartment and villa options in Jaisalmer. For those flying into the city, Jaisalmer Airport lies 17km south-east of the city. It has connections to other Rajastan cities as well as Dehli. Daily trains run between Jaisalmer and Jaipur. The best time to visit the city is from November to March when the temperature does not rise beyond 25 degrees celsius. From April to August, Jaisalmer earns its reputation as the Desert State, with temperatures rising as high as 45 degrees.